The member of the Class of 2021 chosen to be our February Freshman Mustang of the Month is Carson Vetor. Carson comes to us from Liberty Junior High in New Lenox and he is a member of the Christ Lutheran Church community. Carson has already been very active during his first year St. Rita as a member of the Football and Basketball Teams, and he is currently preparing to take the field with the Baseball Team. Outside of his time at St. Rita, Carson assists a local basketball league. In the future Carson plans to get even more involved as he intends to run for Student Government. Representing the Class of 2020 as our February Sophomore Mustang of the Month is Julian Juarez-Butler. Julian is a graduate of St. Mary Star of the Sea School where he is also a member of the parish community. Julian is active in a wide range of activities at St. Rita. He is a member of the Spanish Club, Knights of Augustine, Cooking Club, Students Against Destructive Decisions, Soccer Club, Soccer Team, Vocals Group, National Foreign Language Week Committee and he is currently working with the Theater Group as an Assistant Director of the Spring Play. Julian also helps out at his grammar school with soccer practices and is a part of their Mexican Ballet Folklorico. In the future Julian also hopes to be apply to be a Big Brother, audition for the Fall Play and be inducted into the National Honor Society. Representing the Class of 2019 as our February Junior Mustang of the Month is Brendan Patton. 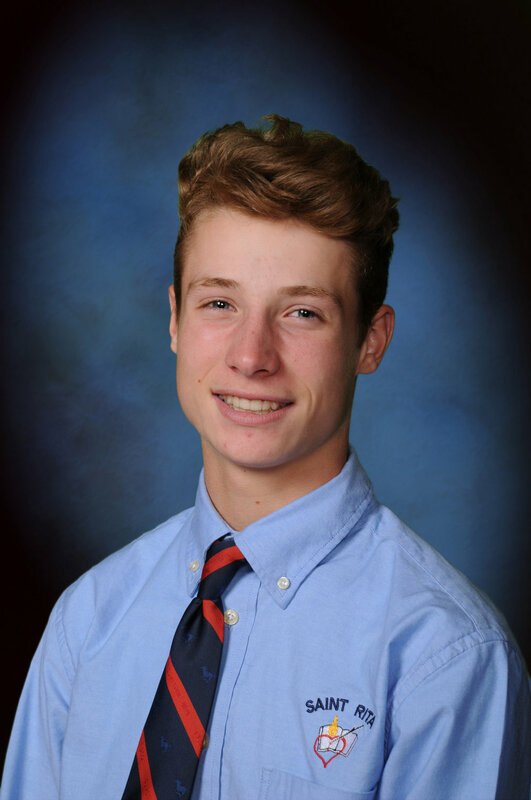 Brendan attended St. Cajetan School and is also a member of St. Cajetan Parish. Brendan is a key member of the St. Rita Golf Team and is also involved with the Knights of Augustine and Stock Club. Outside of St. Rita, he helps to feed the homeless and assists his parish with various events. Leading the Class of 2018 as our February Senior Mustang of the Month is Oscar Norman. Oscar came to St. Rita from St. Sabina School. Oscar has served as a manager for the Football Team and is currently a Big Brother. This past summer he took part in the Summer Service Trip to Asheboro, NC where he assisted in building a house for Habitat for Humanity.